Every morning, I wake up to a plethora of news about the wrongs in the world. The weight often seems overwhelming. What can we individuals do to contribute to fixings the ills of the world? The editorial page is rife with the words of concerned citizens calling us to action. Often, they inspire hope and motions that help us feel like we, given enough time, can overcome anything. Yet no matter how many times I separate my cardboard into the little blue bin, no matter how often turn off the lights when I leave a room, no matter how much I let it mellow when it’s yellow, I still find a world in dire straits the following day. These actions are simply not cutting it. They give us perceived agency, but really they’re just chicken soup for the aware soul. I tell you this not because I think we’re acting in futility. Even while we keep our eyes on the stars, we need to remember that our feet must remain firmly planted on the ground. Small steps can grant us agency, can allow us a sense of accomplishment, and can enable future generations to build from what we’re beginning. That change can begin with pen and paper role playing games. You may be rolling your eyes and wondering how this could be an answer to our problems. If RPGs are the answer, why haven’t we done this before? On the surface, role playing games like Dungeons & Dragons may evoke images of Frodo prancing through a sea of orcs. However, digging deep, beyond geeky role playing games based on Doctor Who and Firefly, beyond dark literary games like Call of Cthulhu and Lord of the Rings, beyond otherworldly references to Asian mythology like Exalted or William Gibson’s Cyberpunk, role playing games offer us as great a range of experience as any medium combined with the truest sense of agency available. In role playing games, you make the choices, you face the moral decisions, and you have the infinite possibilities only available in that plane of true freedom known as the imagination. These criticisms are easy to dismiss. Witchcraft and Satanism are no more encouraged by role playing games than ethnic genocide is caused by chess. Theft is unproven and a claim the authors of the Gizmodo article intend to study more fully, especially given the minimal number of copies kept by libraries to be stolen in the first place. So far, we have recognized that we have serious problems in the world. We’ve also discussed the reasons for the lack of pen and paper role playing books in libraries and addressed their flaws. Yet it may still seem a mystery as to how these games can help. When it comes to social issues, selfishness and lack of empathy have been at the heart of the discussion. From institutional racism to bigotry to ethnic genocide, the alienation of the other is where our dehumanization begins. In RPGs, not only are you provided the opportunity to play as even more extreme others, but RPGs give players the opportunity to experience both cognitive and emotional empathy. The social nature of RPGs demands learning to deal with rude, selfish players. They create a culture in which a Level 3 halfling thief and a Level 20 orc shaman can coexist and work together to rid the multiverse of evil. And RPGs grant players the skills needed to not only cultivate empathy in themselves, but spread it to their brethren. RPGs, which require dice, reading, writing, and critical thinking, offer a perfect intersection to addressing our educational woes by encouraging literacy and math skills. Sessions often last for hours, addressing issues of attention deficit, and the mobility that pens, paper and an imagination offer allow us to move outside, addressing concerns of swaddling our youth in the trappings of technology and urbanization. The art of painting miniatures, making maps, acting, and improv offer a direct connection to the arts. Not to mention the possibility of LARPing in which great feats of agility and strategy have allowed even the most indoor of kids to practice physical fitness. So what can you do? Donate your old DM guidebooks. Organize at your local gaming store. 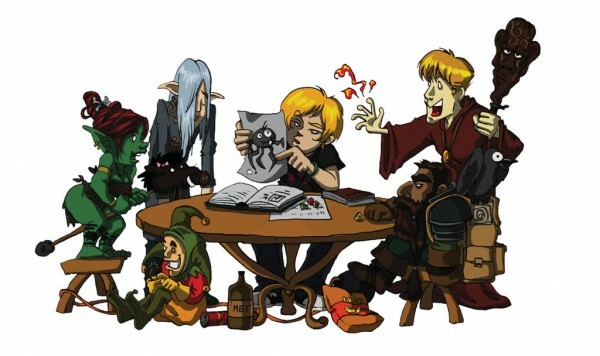 Make RPGs a regular part of life. Talk about your playing with friends so as to destigmatize RPG culture. Most importantly, write or speak to your librarian. You may think that writing your librarian about RPGs is a strange and silly solution, but it can truly make a difference. Every day, your congressmen and senators get hundreds of calls and letters, most that must be ignored by sheer volume. Your librarian, on the other hand, spends their time cultivating our knowledge. They receive few if any letters, and will more readily hear your voice than any politician. Libraries are venues at which we can make ourselves heard, albeit quietly, and the difference can start there. Now let me assure you that getting your local library to carry RPGs will not be an instant fix. It will take years of making RPGs a cultural norm to instill the values that will save us. Today, though, by taking action now, you can ensure a bright future for the children of the world, one where their imagination truly is the limit. Your small steps can prove that we do have agency and can enable our children in the quest to make real change.